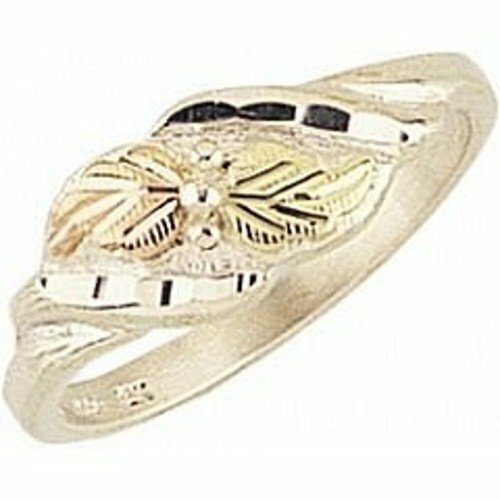 Black Hills Gold Silver Leaf Ring in the Black Hills Gold Jewelry style with 12k pink-gold and 12k green-gold leaves diagonal across top with diamond cut edged sterling silver on a sterling silver shank. All our sterling silver is protected by a Rhodium Finish. Black Hills Gold Jewelry becomes prettier and brighter the more it is worn. Clean with a soft brush and mild soap. Black Hills Gold Silver Leaf Ring in the Black Hills Gold Jewelry style with 12k pink-gold and 12k green-gold leaves diagonal across top with diamond cut edged sterling silver on a sterling silver shank. Diamond cut edged sterling silver adds great shine and sparkle to this ring. All our sterling silver is protected by a Rhodium Finish.